Piano Lessons London – simply the best place for adults to learn the piano in London! If you are looking for the highest quality piano lessons London has to offer, then you’ve arrived at exactly the right place. If you’re an adult looking to learn how to play the piano, or simply to rekindle and reaffirm your passion for this wonderful instrument, then your quest is finished! 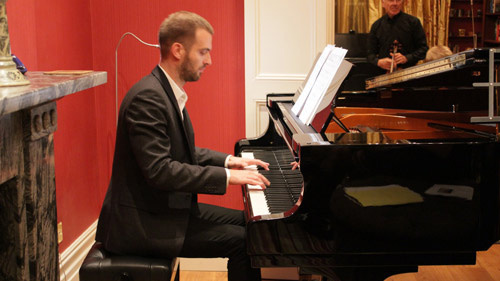 The London Piano Institute offers the highest quality piano lessons in London for adults from absolute beginners to advanced. Our head piano teacher Celine Gaurier-Joubert is a concert pianist and master instructor. She is dedicating her time to teaching and helping adults learn the piano in the most efficient manner possible. Her studies in piano have led to many mind-blowing discoveries of piano playing including secrets of touching the instrument with the correct tone. Her past instructors included some of the most formidable pianists in Europe and the world. It is an absolute privilege and rarity to learn the piano with such a master! You can expect RADICAL RESULTS. Yes, we promise that you will make fast progress over a short period of time. Learning with master musicians has a great advantage. You learn the correct techniques from day one! Our success, depends on your success. Our customer service is a based on a simple philosophy. We provide the highest quality piano lessons to produce the highest quality musicality within you using RARELY SEEN BEFORE methodologies and NEVER SEEN BEFORE TECHNIQUES! How can we be so certain? Because we studied with the best! We know how the best in the world teach. And we plan to beat their approach by caring more for our students. We’ll sit on your side of the table and make you the best that you can be! We are interested in YOUR progress and results! This edge helps us to be the best at what we do, by only teaching adults we know exactly what motivates adult learners and how to find the unique solutions to the specific problems of adult learners have. This should give you the confidence to learn in an environment specifically dedicated to you! If we can inspire and motivate you, then we can change your life! Becoming a successful pianist ( even if it’s just for pleasure), requires tremendous motivation and inspiration of input from teachers who genuinely cares about you! It’s our goal inspires you and bring OUT THE BEST within you!